It’s hard to imagine what could be better on a warm summer’s day than to be enjoying dip in the waters of Lost Land Lake. Located in our beach area is a children’s play area where you can sun, relax, or swim while your children play. 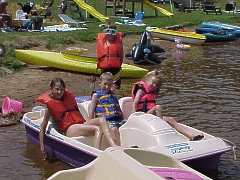 The swimming area has shallow water for even young children to enjoy, and a swim raft for older children. 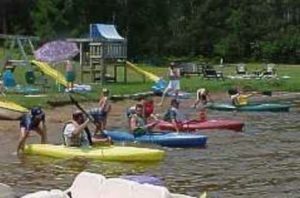 When you vacation at one of our cottages with us we provide complimentary use of paddleboats, kayaks, canoes, and swim toys to our guests.